Many people believe that about half of all marriages end in divorce. In fact, those statistics have been quoted by a great number of people for years. However, according to a recent article in Psychology Today, those figures are not necessarily correct. The article goes on to hint that there is controversy over the true divorce rate because it’s difficult to accurately measure. One of the other interesting points of the article is that some couples separate without actually getting divorced. With average costs of divorce reaching $15,000 and up, it’s no wonder some couples don’t finalize their separation. But that begs the question, should you stay married for financial reasons? Nobody can argue that divorce doesn’t cost money. While it may not cost you $15,000 if the divorce is amicable, it still comes with certain costs that can’t be avoided. For example, there will likely be attorney fees and court costs to pay at the very least. Of course, there could also be alimony to pay on top of legal fees. In addition, if there are children to consider you can expect your costs to go up substantially. Child custody battles can be expensive and child support payments can cost you thousands. Another area that could cost you a bundle is in the division of property. Once again, if there are children involved the division of any marital assets may or may not be equal. Your spouse may get the home if custody of the children is granted to them as well. Let’s say you own a business together. Many different things can happen with a business in the event of a divorce. Either of you may end up with ownership of the business leaving the other with no income. Any or all of these reasons could sway you toward a decision of staying married to avoid draining your finances. But there are other things to think about as well. 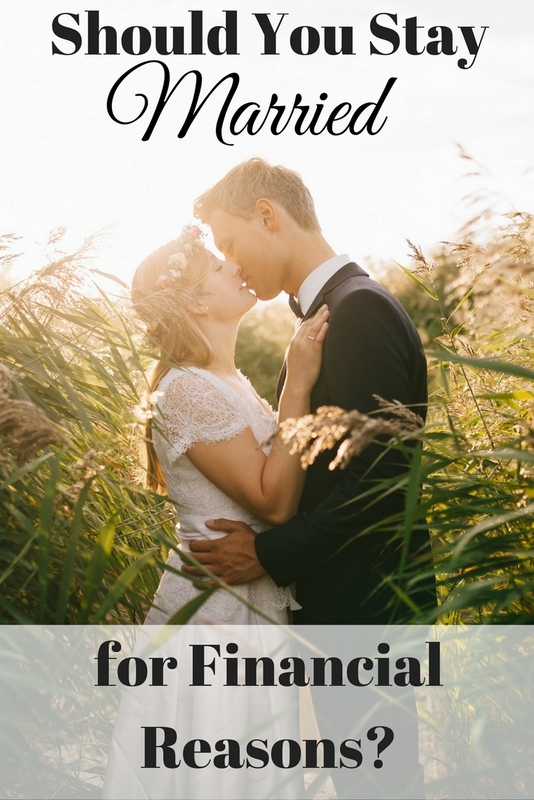 The best way to save both time and money in your marriage is to talk about money issues before you ever tie the knot. Obviously that doesn’t always happen. In addition, you have more assets when you are married longer. When you have more assets as a couple it takes longer to complete the process of gong your separate ways. You may have to meet with your lawyer many times to discuss each issue until a resolution of all of them is reached. If this can’t be done, a divorce trial may follow drawing out the length of the process even more. Obviously, the longer it takes to complete the divorce proceedings, the more it will cost you, which may make you think twice about splitting up. When you have a child together, or several children, it not only raises the costs of getting divorced but it is also very emotionally hurtful to them. Your children may feel like they are in a tug-of-war battle between two parents who are determined to have them at all costs, both financially and otherwise. Even though this is not necessarily a financial reason to stay together, it could be reason enough to work out your differences and avoid the costs associated with divorce at the same time. Sometimes it makes sense to stay together but live separate lives. I know a couple who stayed together on paper because they have a child with health issues. They live in the same house and share household responsibilities as well as care of their child. Despite this, if they choose to date other people they have agreed to allow it of each other. The arrangement has benefited them financially as well as in caring for their child. In other cases couples who have stayed together have found they were able to work out their differences and end up happier for it. I can tell you personally that there were a few times in my own marriage when my husband and I considered divorce. Now, many years later, we are very happy that we stuck it out and made it through the rough times. My husband and I have agreed we are financially better off and happier because of it. Staying together for financial reasons may not make sense if there are other factors to think about. For instance, have you or your spouse committed infidelity? Or, is one of you being abused by the other? What if your children are being mistreated? These circumstances can make staying together for financial reasons out of the question. There are a lot of variables to take into account when you are thinking about whether or not to get divorced. Staying married for financial reasons is only one of them. 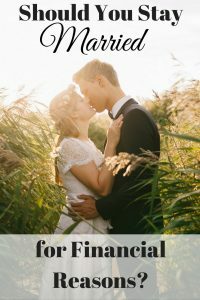 Therefore, the answer to the question of whether or not you should stay married for financial reasons depends on your unique situation. Only you can answer it, but you should certainly weigh the decision and its consequences carefully before taking any action you can’t undo. How do you feel about the idea of staying married for financial reasons?